THE Plastic Piling Company, offering the widest range of PVC sheet piles from leading producers from Holland, Poland, Italy and the USA. It also has some accessory agencies, such as the JetFilters and the new EMS Series Piling Vibrators. The new Hammerman brand has be established to provide equipment support for the plastic sheet piling and to also push hard the new EMS Series vibrators. Following completion of management negotiations we would wish to advise clients that Mr John and Mrs Heloise Coley are no longer part of or involved with The Hammerman Equipment Plastic Piling Company Limited T/as THE Plastic Piling Company and will concentrate on their independent business, Aldridge Piling Equipment (Hire) Co. Limited. THE Plastic Piling Company wishes Mr and Mrs Coley every success in their future endeavours but, in a wish to avoid any possible future client confusion, would confirm that there is no business connection or formal relationship between The Hammerman Equipment Plastic Piling Company Limited T/as THE Plastic Piling Company (or its owner and Managing Director, Mr David Coley) and Aldridge Piling Equipment (Hire) Co. Limited (or its owners and directors Mr John Coley and Mrs Heloise Coley). The introduction of new advanced designs in plastic sheet piling; the first time products were available with designs to optimise the performance of the material. Rather than emulating steel designs. 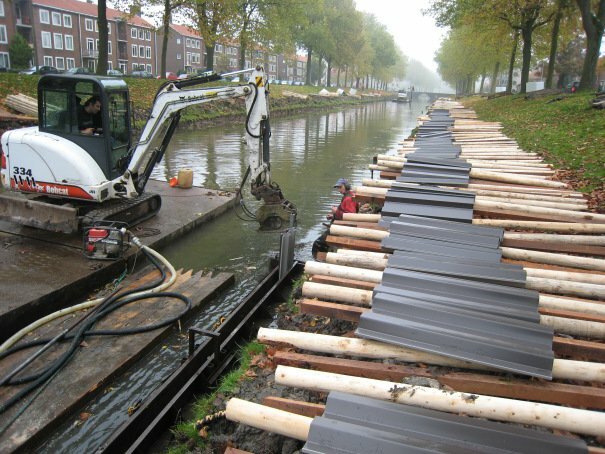 The introduction of the plastic piling Hybrids combining the use of plastic sheet piling with softwood timber posts, steel tubes and even concrete. Provide systems that offer the best of both worlds, improving installation and system performance.